Before we get to this Review & Outlook, below are some of the Best Bullion Market-Related News articles that were taken from this guide's home page, over the last several weeks. Before we move on to this week's 'Review and Outlook,' I first wanted to apologize if some of the vertical wording in the charts. I had planned to make today's blog post the first to be on video, however, due to a small cold, in each take (which many were made) I was unable to finish narrating a full video. Because of this, and the fact that I didn't want to throw away all the work that I did for this blog, I had to resize the charts to fit the parameters of this website, in addition, the blog is being posted a little later than originally planned. After I completed the chart re-sizing process, I thought some of the vertical writing in the charts was hard to read, and perhaps you may too, if so, please accept my apologies. As for when I plan to start posting these blogs in video format, I cannot give you a set date, however, I do hope to start doing them sometime in the relatively near future. In the 'review' section, a copy of the previous outlook for an asset is posted. The outlook for the dollar mostly depends on fundamentals and which way the election swings in three weeks. Technical analysis is virtually useless until after the election. If the Democrats take control of the House of Representatives it will likely cause the dollar to fall because economic expansion could be jeopardized. However, if they don't win the 'House,' then we can expect to see the dollar rise higher. Over the next three weeks, it's likely we'll see the dollar move sideways as it skirts along the $95.00 Support / Resistance level. 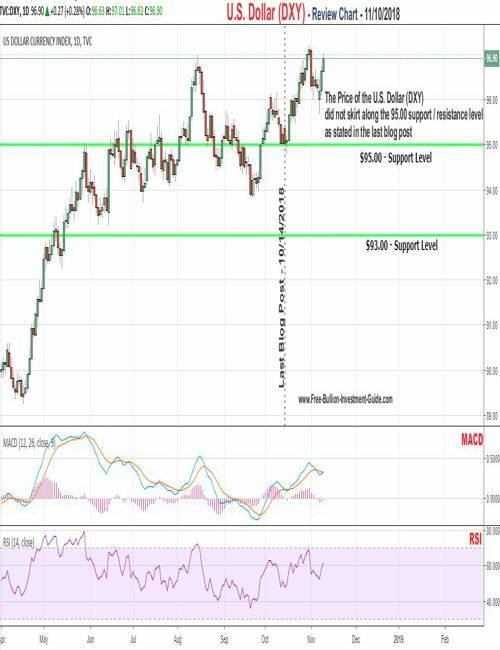 As it is stated in the 'Review' chart below, the price of the U.S. Dollar did not skirt along the $95.00 support level over the last several weeks. Instead, the dollar rose in price after the last blog post, some of the rise was due to uncertainty behind the Mid-Term Elections as traders searched for a liquid safe-haven, and some of the dollar's movement was due to the Federal Reserve's constant talk that higher interest rates are needed. So, the U.S. Dollar didn't do as expected in the last review, it rose to the $97.00 price level before it broke down and now it's on the rise again. 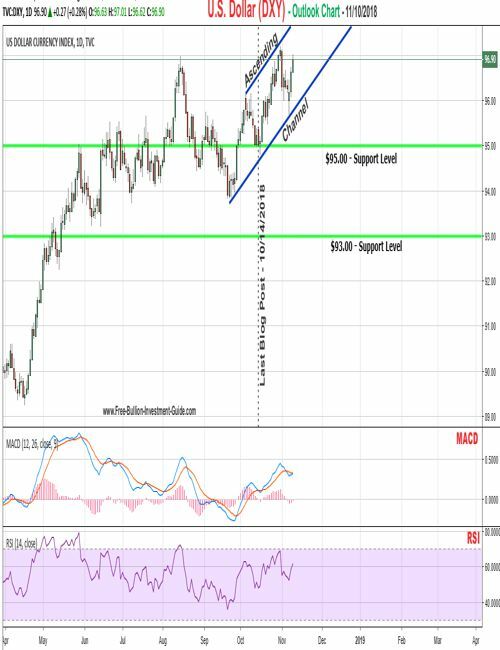 Right now that question cannot be answered, but in the immediate future, the dollar's outlook indicates that it will continue to move higher inside the channel. In the last blog post title; 'What's Going On? 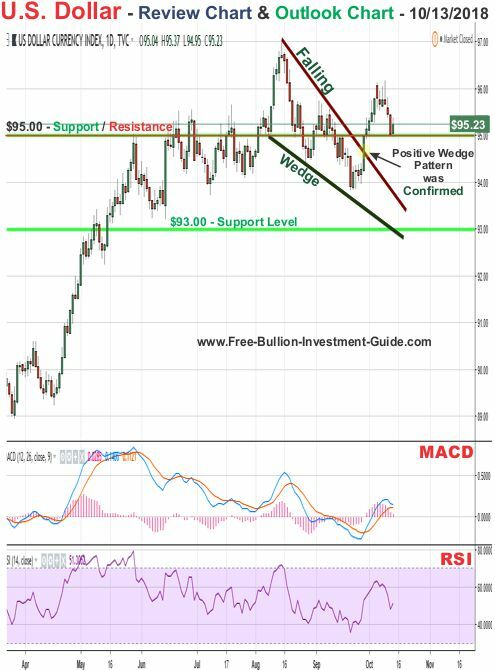 Market Overview' the outlook commentary and chart below was posted for silver. 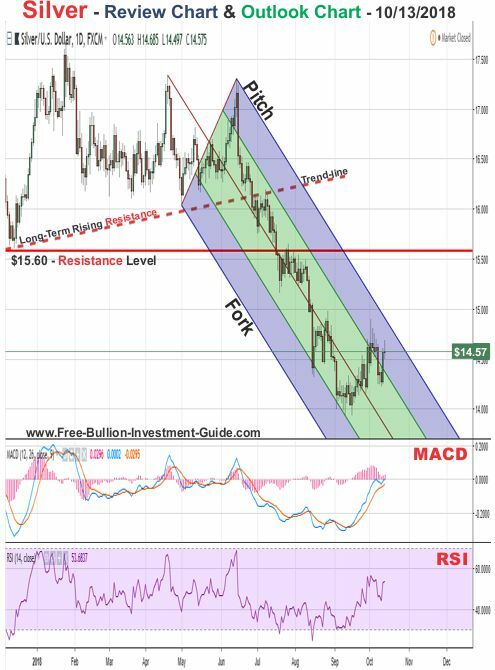 Silver's currently bouncing between $15.00 and $14.00, its trajectory is moving higher, but it is still trading inside the Pitchfork, which isn't good. For silver's outlook, more of the same is expected until after the election, (edit) - expect a) sideways movement with an upward slant. However, shortly thereafter, the price of silver fell in price and even though it did rise back up to its original level before it fell, it fell again. So, the price of silver did not move sideways with an upward slant, it moved sideways with a downward slant. 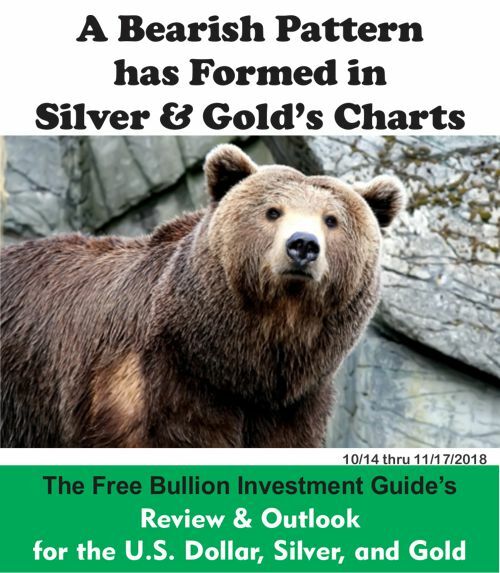 In silver's outlook chart below, you can see the 'Bearish Pattern' that has formed in its chart. The pattern is a Bearish or Negative Pennant. 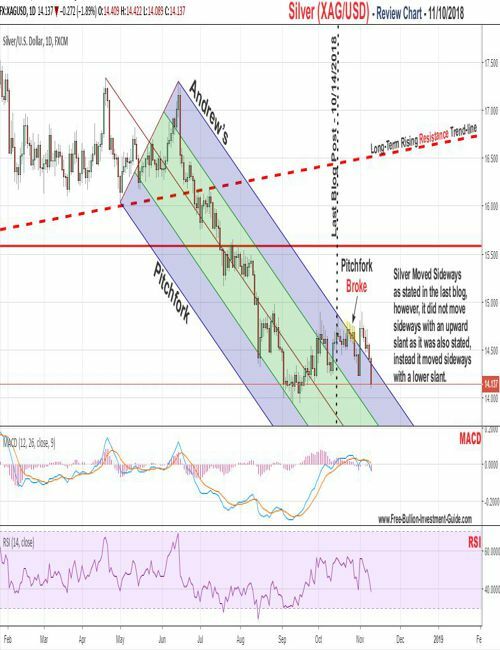 The price of silver could trade inside the pattern for a little while, however, it is expected to continue to fall in price and confirm the pattern sometime in the near future. 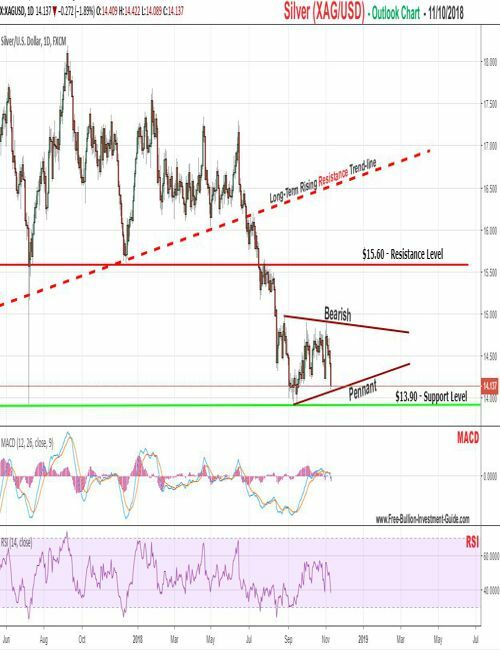 Silver does have two strong support levels below the Bearish Pennant, the first is the $13.90 level (shown) and the next is the $13.60 price level (not shown). So silver's outlook is for it to confirm the 'Bearish Pennant' in the next week or so, but it should find support between the $13.90 to $13.60 price levels. The following chart and commentary was posted in gold's last outlook. 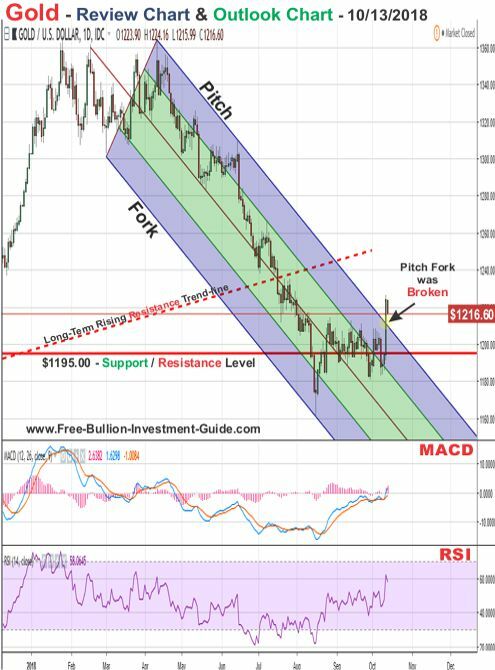 Gold's break above the Pitchfork is a good sign, and it could be a sign that a bottom has been found, but, I'm not convinced yet until after the U.S. Congressional election. For gold's outlook, I've tried to find a technical pattern in gold's chart, but there aren't any, fundamentals will drive gold's move over the next three weeks, which will likely move like silver; sideways with an upward slant. Overall, depending on how the polls look, as the election draws near, Gold will move depending on how each political party looks. If the Democrats take control of the House of Representatives, then we'll likely see gold (and silver) spike, but if the Republicans hold, we'll likely see more of the same out of gold. In gold's review chart, you can see that it moved much in the same way that silver did, however, it had greater falls in price giving it a sideways movement with a 'downward slant,' not an upward one. In addition, although the Democrats did win the House of Representatives, many of the seats that they won were close races, meaning although I expect the Democrats to investigate President Trump, it's doubtful that they'll be able to get the votes to impeach. So, that is why the price of gold and silver did not spike in prices after the election because even though the Democrats will take control of the House in January, had they won with a larger majority of representatives we would have seen more uncertainty in the markets and gold and silver move higher. 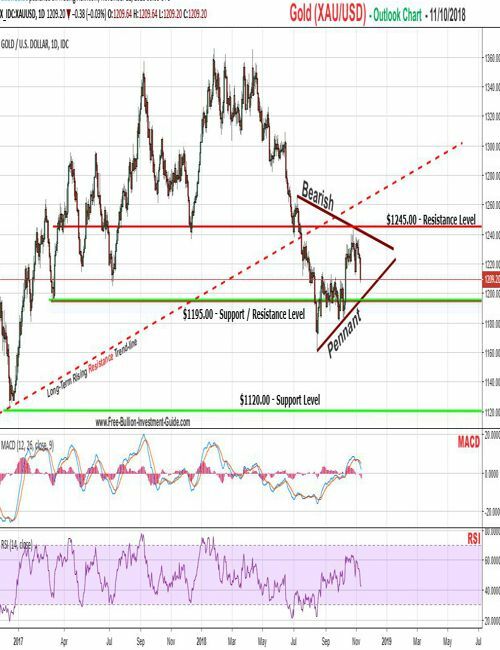 Inside the pennant, is the resistance level of $1245.00 and the support level of $1195.00, gold does not look like it will be testing the resistance level anytime soon. 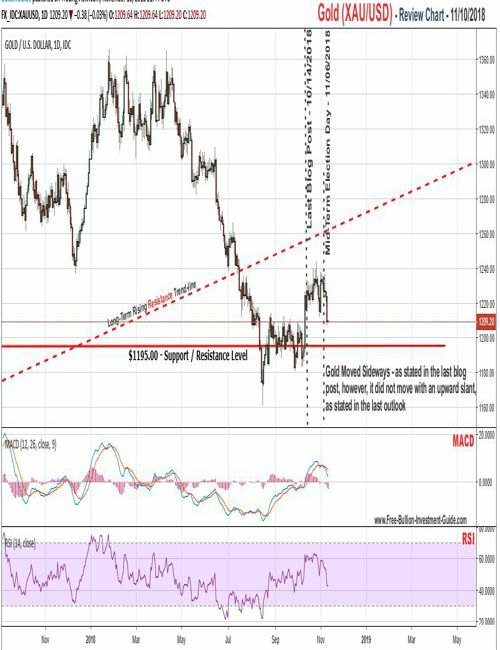 Instead, gold's outlook is showing that it will confirm the bearish pennant to the downside sometime in the near future, and test the $1195 support level at the same time or shortly thereafter.